In a bowl, crumble the Tofu with a fork into small chunks. Then, mix in the rest of the ingredients with a large spoon. Once it's completely mixed, with no clumps of seasoning, you can sprinkle it over the completed Spinach Salad. With your 1 Teaspoon measuring spoon, scoop a half-circle cup out of the Tofu . This is what you are going to fill with your "yoke", so make sure it isn't too shallow - but you want to make sure it isn't too deep either, because it'll make your "egg" fall apart. So try to make it about the same size and depth as the measuring spoon. In your delightful little iron skillet, cook your Fake Bacon in 2 Tablespoons of Olive Oil with a dash of Liquid Smoke at a medium heat. Once it's crispy, remove it from the skillet and set it aside. You want the Oil on the Fake Bacon, so you don't want to put it on a paper towel like I usually tell you to. Cut into bite sized pieces. Add the last Tablespoon Olive Oil--and maybe another dash of Liquid Smoke--and take the heat down to low. We're recreating Bacon Fat. Yeah, gross, right? But we're going for the smokey flavor so we're using the Liquid Smoke. I added another dash. I love liquid smoke; if you don't, one might be enough. Then, add Green Onions, Parsley, Lemon Pepper, Celery Seed, Braggs, White Wine, Garlic, and Agave Nectar. Heat until the Green Onions become tender. Then, add White Wine Vinegar and Lemon Juice. Remove from heat. Put your Spinach in a large bowl. Pour the warm Salad Dressing over the Spinach and toss your salad to coat. 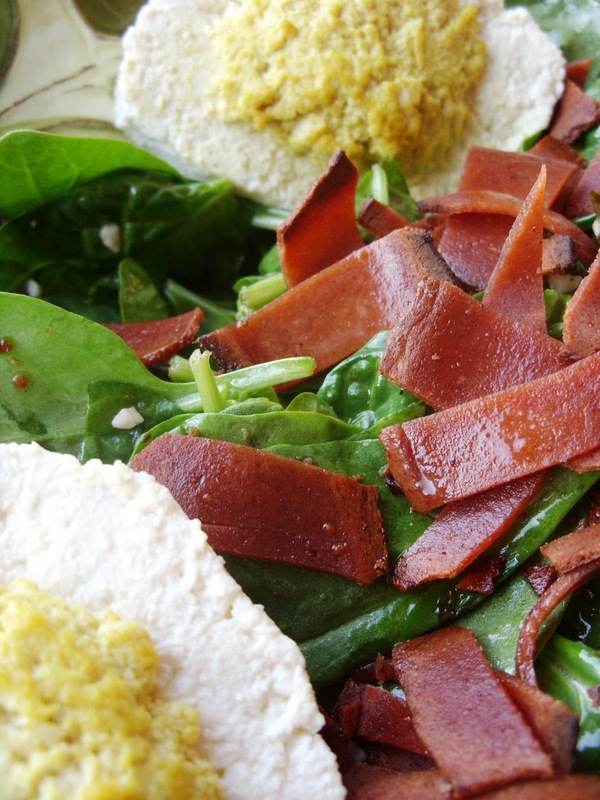 Place your Eggs around the bowl, and sprinkle the Bacon Pieces over the top of your Salad. You need to serve the Salad immediately so it doesn't wilt too much. When you eat it, make sure you get a lot of dressing on your Eggs, because they taste almost poetic together. I've been making a much simpler version for a number of years. For egg substitute, I simple take a block of tofu (medium to extra firm) and divide it roughly in 1/3 2/3 parts. I grate the larger section using the largest holes on a square grater. The remainder I crumble by hand and using a fork to mash a bit. I add a little tumeric (or even curry powder for a more exotic taste) to the crumbled portions. To keep things simple, I use vegan bacon bits (usually Betty Crocker, co-incidentally). Often I use baby spinach. (No need to cut or tear.) My dressing is lemon and oil with a little minced garlic. Not as true to Betty as yours, which i want to try, but works when time is short and especially on Shabbat when we don't cook.